If you want to know which turbo trainer you should buy then our BEST TURBO TRAINERS for 2018 guide is for you. It shows the Best High-End Direct-Drive Turbo Trainer, Best Mid-Range Standalone Turbo Trainer, and Best Low Priced Turbo Trainer. 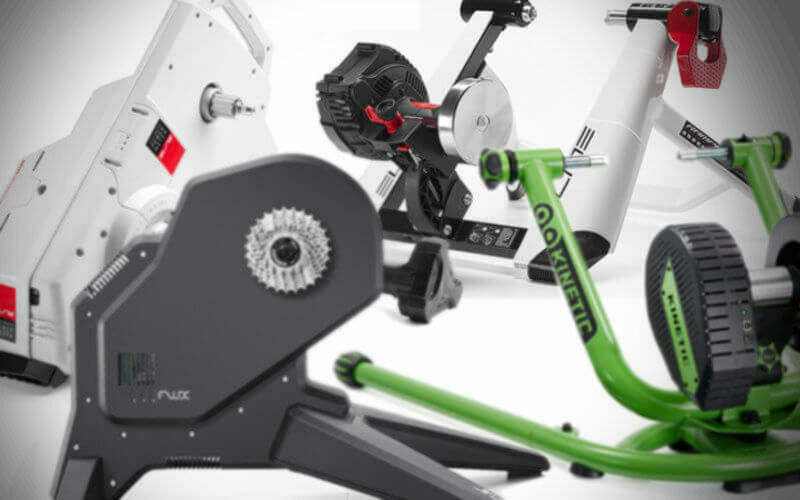 Here, in this article we are going to go into details about the different types of turbo trainer that will help you decide which is best for you and you training needs. 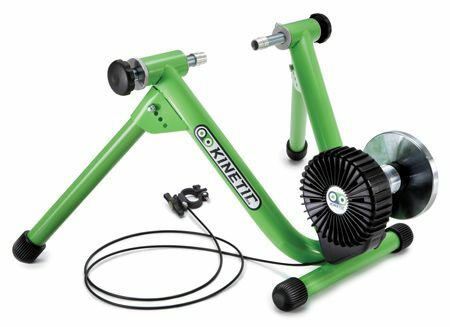 Turbo trainers (aka indoor cycle trainers & bike trainers) let you ride your standard road bike indoors. They are popular in the colder winter months when it is more difficult to get outside on your bike, because lets be honest, if its raining, dark, and cold most of us don’t want to venture outside. They are also used for specialist training or for pre- and post-race warm-up and cool-downs respectively. Turbo trainers come in all shapes and sizes, so which is the best turbo trainer for you? The first thing to consider is price, it is probably the single biggest factor in your buying decision. The price of turbo trainers varies enormously and you can pay anything from £50 all the way up to £1000+. Obviously with such a wide price range there is a wide range of turbo trainer types that come with all sorts of features. Here we will cover the main turbo trainer types and features and you will see links to more in-depth articles about specific cycle trainers. By the end of this article you will see which turbo trainer is best for you in 2018. OK, lets get into the specifics. 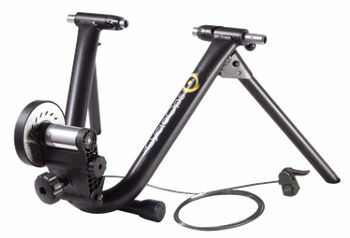 Standard cycle trainers look like the one shown above. They are pretty straight forward to use and all you do is place the back wheel of your bike (or more correctly the back skewer) into the trainer frame and then your back tyre pushes against a roller. As you pedal your back tyre spins this roller. The stiffness or resistance offered by this roller can often be varied so you get a harder workout if you choose. Some bike trainer frames are fixed so once you position your tyre it applies the same pressure on the roller all the time. Alternatively some frames are mobile, which means that if you are heavier and/or you force down more as you cycle your back tyre pushes down more on the resistance roller. There are pros and cons to both fixation options, but to be honest the option of a fixed or mobile frame is not normally a deciding factor in turbo trainer choice (because there are more important things to consider), but we thought you should be aware of this fact. Smart trainers are generally slightly more expensive when compared to entry-level trainers and often have sensors that communicate with smart devices, like your smart phone or tablet (also your laptop or other computer). They also collect useful performance data such as cadence and heart rate with some even collecting (or at least calculating/estimating) power output. Apps and other software let you visualize your data and set workout types to get a better training experience. AKA virtual reality turbo trainers. Interactive cycle trainers offer a more immersive experience and there are some pretty impressive 3D worlds to cycle through. What interactive turbo trainers offer over all other types of turbo trainer is that they can automatically vary your resistance. What this means is that when you cycle up a [virtual] hill the resistance you feel in your pedals will increase proportionally. A 10% gradient should feel like a 10% gradient when you work out. In addition to cycling virtual routes you can do specific workout types and have intense hill climbing interval workouts etc. The combined workout type and virtual environments takes the edge of something that can at times become a little boring (i.e. cycling in your garage staring at a wall). To add even more to the experience you can compete online in races against other real people, which really helps motivate when you need motivating. Now we understand they main categories of turbo trainer (i.e. standard, smart, and interactive) there is the choice of resistance technology. Interactive trainers can only be electromagnetic or at least have a component that can be controlled wirelessly via software. However, standard and smart trainers can use one of the following resistance types. Wind turbo trainers (aka air turbo trainers) use air resistance as their primary resistance technology. Basically what this means is that as you pedal your back tyre spins a roller that in turn rotates a blade (or fan). This spinning blade is resisted by the air and the faster you spin it the more resistance there is. For this reason people say wind resistance trainers are some of the most realistic available. 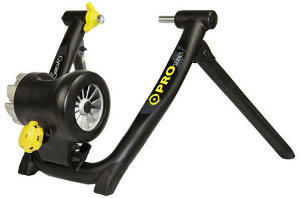 The major pro for wind turbo trainers is their cost. 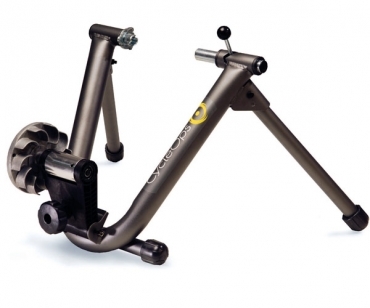 Generally they are the lowest cost bike trainer because they are the simplest to manufacture. However a big con is that they are noisy. They can get very noisy when you really push them so if you are using the trainer in a location close to other people it may not be the best option. Wind trainers are also lacking in features, they tend to be simple ‘setup and ride’ devices without any other added features that other trainer types may have. 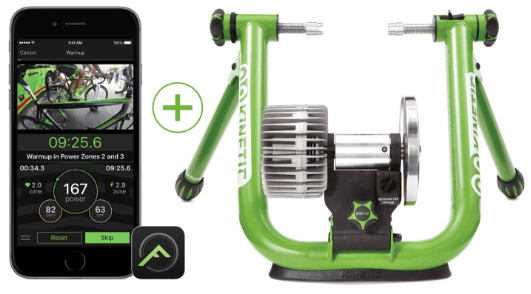 Magnetic cycle trainers are probably the most popular entry-level trainer. They work by spinning a metal disc relative to magnets (or vice versa) which generates what are known as ‘eddy currents’ that offer a resistance. While a relatively simple technology the good thing about magnetic resistance is that you can move the magnets closer or further away from the spinning disc to create higher or lower resistance. This can be controlled by a handlebar mounted lever so you can modify the workout resistance as you pedal. Fluid cycle trainers are considered realistic (i.e. comparable to cycling on the road). They work by spinning blades in fluid and the viscosity of the fluid can be carefully controlled to give a very road-realistic feel. The resistance generated as you pedal faster or slower is similar to real-life too, which all adds up to a great feel as you cycle. Like wind resistance you generally only have one resistance setting. Effectively it is like riding on a flat road and you cannot simulate hills etc. Although more expensive models do combine magnetic (or electromagnetic) technologies with fluid to offer more resistance options. Fluid trainers are generally very quiet when compared to other types of resistance, so this combined with the road-realistic resistance are 2 major pros of fluid turbo trainers. Electromagnetic turbo trainers are the most expensive and feature rich you can get. They use electromagnets to control resistance and resistance can be varied using software so that you can simulate inclines as you ride and everything can be controlled automatically and synced to the [GPS] route you are riding or to the workout program you are following. Learn more about electromagnetic turbo trainers here. There are also motor turbo trainers but these are less common. They behave in a similar way to electromagnetic bike trainers except have the added feature of being able to drive your back wheel. So, if you are riding down a hill on your virtual reality turbo trainer the motor will spin your back wheel and it will feel just like you are cycling down hill. This is the only type of turbo trainer that can do this. The most common type of turbo trainer works by pushing your back tyre against a roller. You pedal and your tyre spins this roller that in turn offers resistance. Direct drive turbo trainers on the other hand physically connect your bike to the frame of the trainer. You remove your back wheel and fix the folks of your bike frame to the trainer. Your chain then wraps around cogs that are part of the trainer. Direct drive trainers transfer 100% of your pedal power to the trainer and are therefore more efficient. They can be quieter than standard trainers (that use a roller) because they eliminate tyre noise, and they also eliminate tyre wear. Direct drive trainers are becoming more and more popular with most major brands having a direct drive model. Roller trainers offer a very different way to workout at home on your bike. Basically roller bike trainers have sets of rollers that you cycle on. You do not fix your bike to them and they require a little more getting used to. However, once you get going they can be more fun than standard turbo trainers. You need to focus to maintain balance and position on the rollers, and it is more of a full body workout because you are continuously engaging your core muscle groups to maintain your balance. Most major cycle trainer brands have at least one roller trainer model. 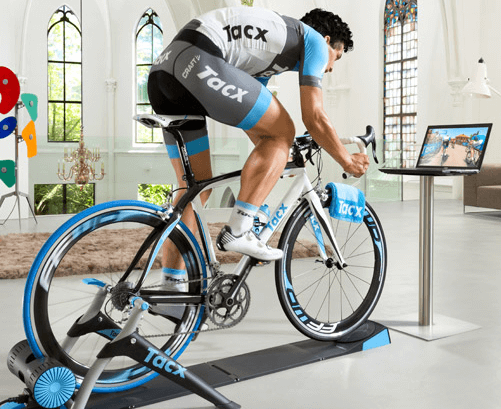 SUMMARY – WHICH TURBO TRAINER SHOULD YOU BUY? As you can see there are a million and one options when it comes to turbo trainers. Ultimately your choice comes down to price and features. If money is no option go for an interactive electromagnetic turbo trainer and probably choose a direct drive model. If you want something to just easily use for a quick but good workout then a simple entry-level magnetic trainer will do, but if you want something that is cost effective but road-realistic look at a fluid turbo trainer.